First…I guess Tua Tagovailoa is human, after all. (Um, that’s sarcasm in case you didn’t know.) The Alabama QB threw his first interception of the season in yesterday’s game at arch-rival LSU. However, he threw for 295 yards and two TDs and scored on a 44-yard run. (His TD/INT ratio for the season is only 27/1. Yes, sarcasm again.) Alabama dominated #3-ranked LSU 29-0. The Crimson Tide out-rushed the Tigers 281 yards to 12 although in college football quarterback sacks are deducted from rushing totals unlike the NFL. “Sure, Saban might love stifling, bloody-your-nose defense the way most of us love our grandmother’s cooking, but he’s anything but close-minded. He knows as well as anybody what he has in Tagovailoa, not to mention the best collection of playmakers across the board that Saban says he has ever had at Alabama…At his core, Saban is who he has always been, and this Alabama football team is what everybody thought it was heading into the most anticipated showdown of the season. But Saban has also adapted and won in a fashion even he probably wouldn’t have believed 10 years ago. ‘Hell, you’ve just got to coach what you’ve got,’ Saban said. ‘And even though I thought we were going to have a different kind of team, we also lost five guys in the two deep on defense, our best outside linebacker and pass-rusher [Terrell Lewis], our best corner [Trevon Diggs] and three other really good players who would have been backup players. I’ll tie this into my thesis that people who blindly follow an ideology are going to be wrong most of the time. The more complicated the venue, the more that blindness is a detriment. By the way, I didn’t watch any football yesterday and will not today or tomorrow. I am giving myself a football-free weekend. With the Internet I can consume as much football news as I want without actually watching. From Bring a Trailer a picture of a Studebaker Gran Turismo (GT) Hawk. This is not the first photo of this car I have shown on Disaffected Musings. OK, why would I even think of using this for a restomod? First, I have a bad combination of traits: OCD and ADD, although both are not cranked up to a level anywhere approaching 10. For part of me it is difficult to stay focused on one thing, but for another part of me all I can do is obsess. Trust me, you don’t want to be inside my head. Second, I think the GT Hawk looks amazing. Third, only about 14,000 GT Hawks were made while the number of C2 Corvettes approaches 120,000 so I would have something more rare and exclusive. Fourth, buying a GT Hawk for a donor car, even a nice one, will cost less than buying a C2 Corvette. 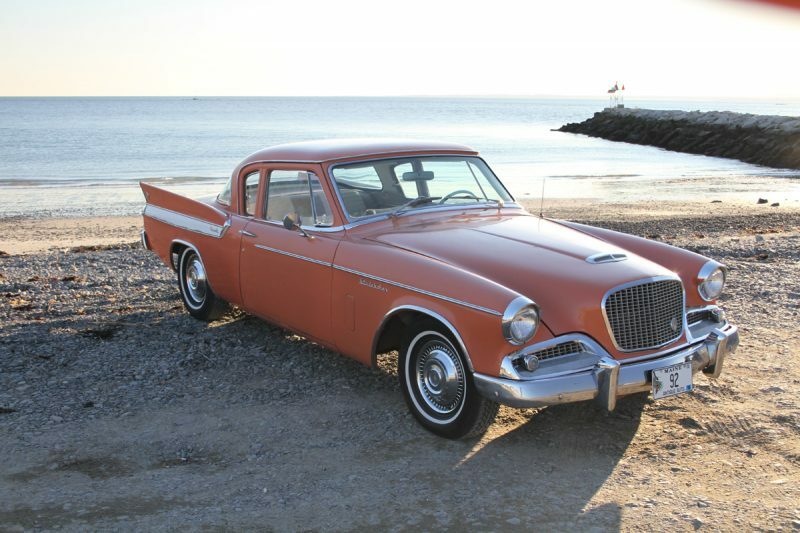 From motorlandamerica.com a picture of a 1961 Studebaker Hawk. Brooks Stevens was given the task of redesigning this car for the 1962 model year on a limited budget. What did he do? The only new stamping was the roof; he removed the fins and added a chrome rocker panel molding. Not much else changed on the car and yet the transformation was amazing. It’s a bad Sunday for a football blackout. First the Ravens host the Steelers. Then a good NFC showdown with the Rams and Saints. With Brady vs. Rodgers for the nightcap. Mrs Babowsky would frown upon me lying on the couch from 1:00 to 11:30 pm watching these games, but I would love to. I need a break from watching football. I watch college football. The NFL lost me years ago; however I do read the internet to see how the Arizona Cardinals are doing. 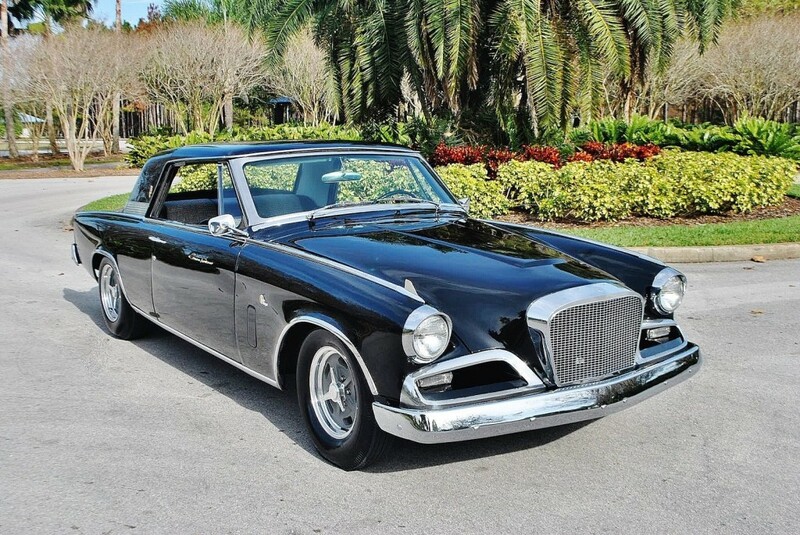 The person who customized the black Studebaker GT Hawk chose the most beautiful wheels by selecting the American Racing Salt Flat Specials with grey centers. Of course I am prejudiced because those are my selection for my 1948 Ford F-1 Lightning truck project and are mounted on the truck as we speak/write. I am with the 1%, the Stude GT Hawk would be a wonderful restomod. Just so different, and you could use the powertrain as the Vette.